This route is easy to describe as all you need to do is take Route 10 between Walton and Deposit. One suggestion to get to Walton is to start in Oneonta, NY where you can take State Rt. 28 south to Delhi, NY (another great ride in itself). Then take Route 10 south to Walton and just continue south on on Route 10. 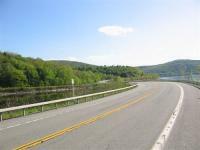 If you are coming from points south, say NYC, take State Route 17 north to deposit, NY and head north on Route 8 and take a right onto Route 10.
this is one of the most scenic roads in the entire state! you travel right thru the cannonsville reservoir which appears on both sides of the road. once you leave Walton, NY and head south on rt. 10 (a fantastic road which you can take from its beginning in Higgins bay up in the Adirondacks, all the way to the end in deposit in the Catskills) there are no more towns except for the ones which are underwater (this is NYC's drinking water) and the road is all yours with hardly any traffic at all, mostly locals and other bikers. you feel as if this is your own personal highway. the background scenery is the Catskill mountains which completely surround you without a house in sight. the road itself is a two lane highway with very wide shoulders and long sweeping turns, mostly level terrain and very nice open spaces on either side with either the reservoir itself or open meadows. there are several places to pull off the road and enjoy the scenery. Once you reach the end turn around and ride it back up. this is an older road with a concrete base which just recently was repaved, it is smooth and level with plenty of wide sweeping turns, which in this case is good so you have an opportunity to look at the scenery which is just as wide and sweeping as the road. Traffic is very light here because it really doesn't go anywhere or come from anywhere. this road was built for motorcyclists - period! once you leave either Walton to head south or deposit to head north there are no services at all on this stretch of highway, just scenery with water, bridges, mountains and sky and that's it. in Walton there are all the services you may need, several restaurants, gas stations, bars and anything else you may need. the same is true for deposit, so the 1 star rating that I gave to this road for amenities is strictly for the road itself between the two towns. on October 18, 2015 0 out of 0 members found this review useful. You have to stop at Butterfield's at the end of your ride. Awesome!! Road this route last weekend in perfect weathert! Road has weathered some in the last 4 years but stll has the same beautiful turns, low traffic and smooth curves. It has to be one of downstate NY best. on April 20, 2013 0 out of 0 members found this review useful. Superb ride. Combine with RT.97 and Catskill rides for as much fun as you can have on a bike this close to NYC. on July 7, 2010 0 out of 0 members found this review useful. Took this route yesterday. It was very fine. Long winding road, nearly empty of cars. This route passes along the reservoirs that feed NY City. You can connect off this road for other equally fine roads. We headed east on 10, then took 206 south to route 30, heading east. Highly recommended if you like long empty sweeping roads. Awesome ride which we do at least once a year. Now when you get to Deposit.... you really need to slide a mile or two south to route 97 and take it along the Deleware river through the Hawks Nest to Port Jarvis.... will be worth the extra miles. Beyond any shadow of a doubt one of the best rides in New York State. The pictures here don't do it justice. A must see for anyone passing through this area. You won't regret it a bit. on May 31, 2009 0 out of 0 members found this review useful. My buddies and I love this rode. It has some long sweepers and the road is in decent shape. It also offers a great view of the reservoir. We gas up in Oxford and grab something to eat there. Fun times.